Mentorship in Academic Medicine is an evidence-based guide for establishing and maintaining successful mentoring relationships for both mentors and mentees. 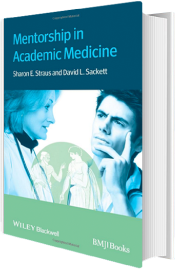 Drawing upon the existing evidence-base on academic mentoring in medicine and the health sciences, it applies a case-stimulus learning approach to the common challenges and opportunities in mentorship in academic medicine. Mentorship in Academic Medicine provides useful strategies and tactics for overcoming the common problems and flaws in mentoring programs and fostering productive and successful mentoring relationships and is a valuable guide for both mentors and mentees. Effective mentorship is a major determinant of academic success and both job and life satisfaction. However, although most studies of academic faculty suggest that they want mentorship, there are many academic settings in which less than 20% of them get it. In light of this gap, many academic health institutions are developing mentorship programs and, in doing so, have recognized the lack of educational as well as administrative resources to educate and support both mentors and mentees. This book is about the practice of mentoring, and we wrote it to help meet this need. Mentorship in Academic Medicine is written for aspiring academic researchers and educators (hereafter called ‘mentees’) and those experienced, empathic persons who guide them in the development and re-examination of their own ideas, learning, and personal and professional development (who we’ll call ‘mentors’). At the individual mentor – mentee level, we’ve presented the best evidence we could find on what they should look for in each other, how they should find each other, how they should treat each other, how they should plan and run their mentoring sessions, and how they should identify and manage the opportunities, challenges, and problems mentees encounter as they launch their academic careers (including how to fix or sever mentorships that aren’t working). At the institutional level, we’ve presented the best evidence we could find on how to assess an institution’s need for and interest in mentoring, how to develop a mentoring program and train mentors, and how to evaluate it, correct its faults, and sustain it. Our systematic reviews and updates of the mentorship literature. Our 2012 survey of international colleagues who have been recognized by their peers as being excellent mentors. Our own experiences as mentors, mentees, and developers of institution-level mentorship programs. There is a wide range of studies included in the analyses with no major limitations. There is little variation between studies. Summary estimate has a narrow confidence interval. There are only a few studies and some have limitations but not major flaws. There is some variation between studies. The confidence interval of the summary estimate is wide. The studies have major methodological flaws. There is important variation between study results. The confidence interval of the summary estimate of the effect is very wide.